Daisy Rock describes itself as the "girl guitar company" (as opposed to catering solely for men with bad perms and body odour). 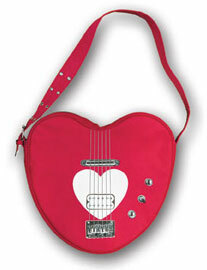 We’ll do a proper feature on some of their more retro guitars at a later date, but in the meantime, check out Heartbreaker Guitar bag. Based very much on one of the company’s big sellers – in fact including all the detail from the Heartbreaker’s body – it also features a zip fastening and matching red strap. Available online, you can pick it up for around $25 (around £13).